I received this plant from a local store and they didn't now know the specific name of it. Since bringing it home though, it has not done well. The bottoms of the stems have all dried and turned brittle. It is odd though because it seems like some of the tops are still living. 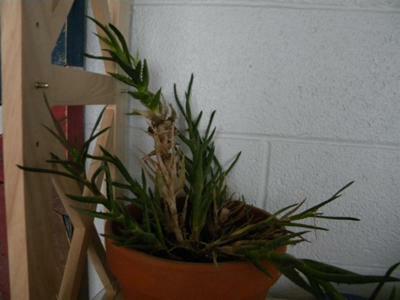 I was hoping to identify this plant and find out if it is possible to save at all, I wasn't sure how this type of plant might propagate. Hi Andrew, what you have is a prime example of a very overgrown Aloe. The many varieties and species that stay fairly small are reliable houseplants, given the right conditions, primarily extremely bright light. They will get very leggy and tall by reaching towards the light if it's not bright enough for them. However, all is not lost; they are easy to propagate, and you'll end up with lots of gorgeous healthy plants. What you will need to do is 'unscrew' the top healthy rosette, just like unscrewing a light bulb. Then you can stick the end of the cutting into dry potting soil - use something that has great drainage, such as cactus soil, or regular potting soil with additional pumice, lava rock or gravel in it. See the succulent soil page. 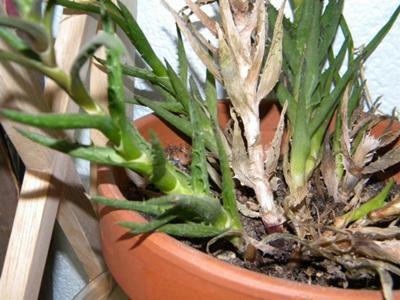 Don't water it for a couple of weeks, and before you know it, roots will have formed out of the sides. 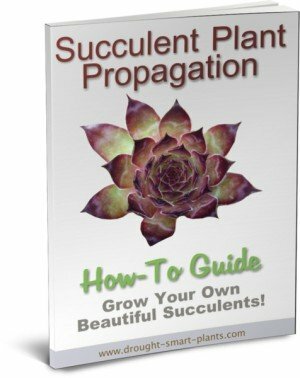 See the Succulent Plant Propagation page for more. 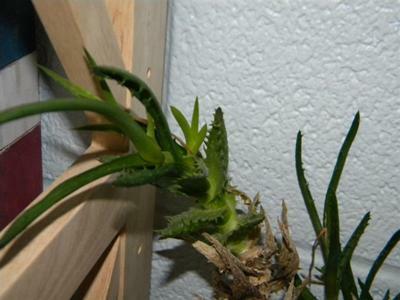 Best of luck with your Aloe!